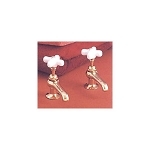 Antique Reproduction Lav Faucet Singles Set with Porcelain Lever Handles is 4-inch tall, 3 1/2-inch wide, and has a base 2 3/8-inch wide that extends 5-inch. Minimum hole size is 1 inch, maximum counter thickness is 1 1/2 inches. 1/2 inch IPS hookup. Includes supply nut/washers and lock down nuts. Flow rate: 2.2 gpm. 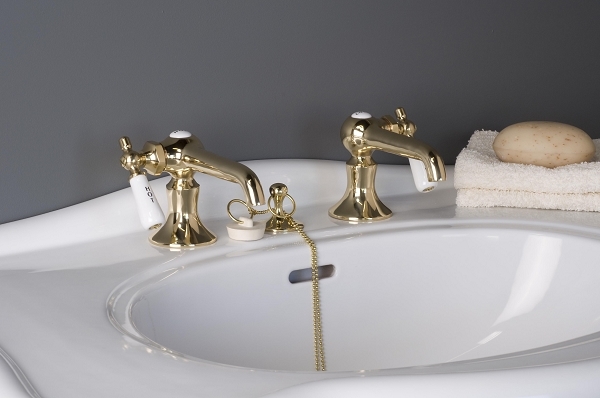 Available in choice of Chrome or Lacquered Brass finish (shown in image).